Review: No question this binder holds up far better than the standard office supply store 8.5" binder, and the seven-hole paper design keeps pages from ripping out while flipping pages in turbulence. The downside is this binder suffers from excessive heft. The covers, made from two thick vinyl layers over a cardboard center, could be slimmed down without compromising durability, saving weight you won't have to schlep around in your flight bag. 7-rings holds paper securely although it isn't a common paper format. I bought an inexpensive 7-hole punch and problem solved. I can carry the few approach charts I use most often and file them in convenient order. These binders were made for a now-almost-obsolete format: printed Jeppesen approach charts, but anybody can use a sturdy binder that won't split or tear like every other one out there. Yes, even with glass cockpits, some pilots like to have an easy to find hard copy that doesn't require changing the enroute page on their EFB or tablet, to get approach or airport information. Pros: Good look and feel; standard Jeppesen quality. Review: The plastic version has a leatherette look and feel. It's really closer to the leather version than I expected, so I appreciate the more economical choice. However, like all things Jeppesen, it's still too expensive even at the good price on mypilotstore. Review: Perfect for daily use. Review: Perfect for the subscription I ordered. Review: Perfectly matches the larger binders that were given to me by the airline. 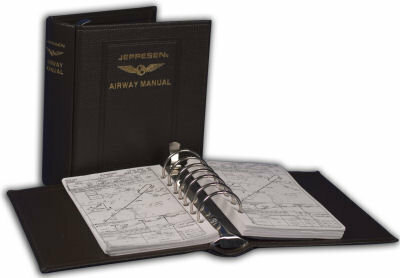 Makes a great trip binder to hold the charts needed for the current trip or day of flying. Review: Good value for the money as not that much difference between the leather binder I have and the plastic one. Review: Does a good job,nice binder.....Should have gotten the 1 1/2 inch..